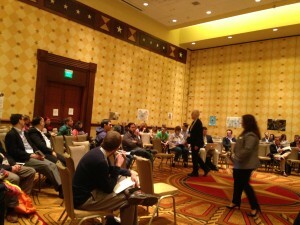 SXSWEdu is over, and I’m unraveling my thoughts about this year and thinking about the breakout trends for next year. 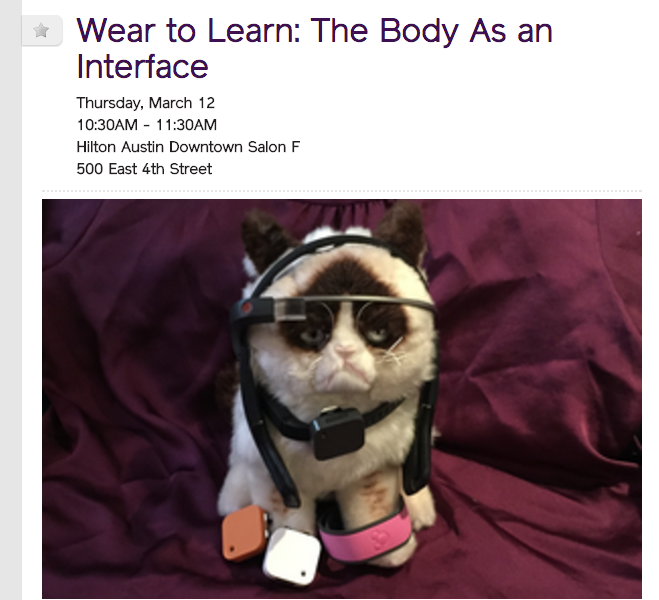 Watching trends from SXSWi as well as the advent of the Apple watch and other devices, I predict wearables will be an even bigger theme at EDU next year(along with the privacy issues they raise). In their “Wear to Learn: Body as Interface” session, Emory Craig(College of New Rochelle) and Maya Georgeiva(Center for Innovation in Teaching and Learning) led an intriguing conversation on wearable technologies. I loved that they went beyond the “these wearables are neat” approach, and delved into the questions we are facing in education as wearables start infiltrating the market. –How can wearables help us personalize learning for students and how in effect, will that change our instructional possibilities? 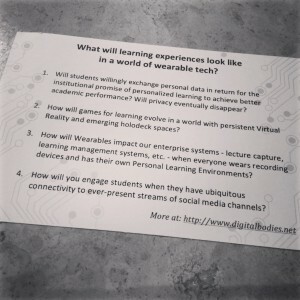 –How do we engage students in a wearable world? 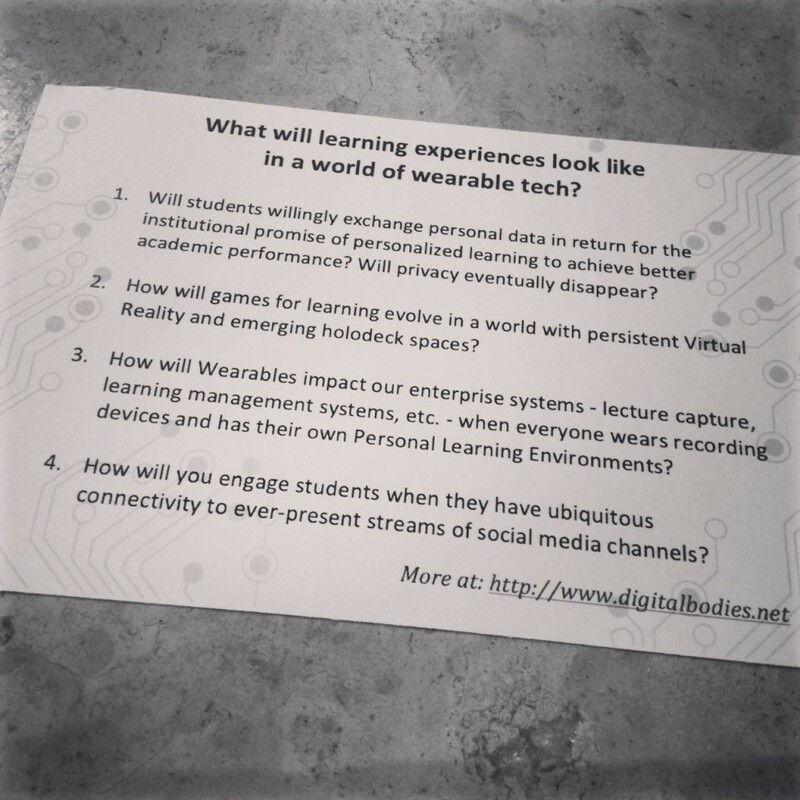 –Will data being gathered from wearables be used to screen out students too? Who owns the data and who has access? –How are wearables going to affect our learning systems if everyone can wear their own recording device that is personalized? –When do we start developing Wearable Tech policies in our districts and how do we make them flexible w/rapid pace of change? –Will students be willing to give up privacy for more information about their learning? Another question I have — if we allow BYOT wearables, which undoubtedly we will(and already are), does this add to the national digital divide our students face, and if so, how will we in edu compensate for that? Lastly, as TED speaker Diana Laufenberg reminds colleagues, we should be wary of getting caught up in the “shiny,” but instead think meaningfully about the opportunities, questions, and challenges that wearables will pose for our learning environments.